hi friends! i hope you had a great weekend, a happy cinco de mayo, a relaxing sleepy sunday and all the goodness that a couple of days off can bring! it’s been way too long since i shared a little snap of ruca bean yates-mora with you (i’ve been mostly sharing our dog styling antics on my instagram). but here she is, she’s bringing in monday with her normal charm and sass. and in 4 short days we’ll be celebrating her 7th birthday! i swear when she runs around our yard or spazzes out when a friend comes over you wouldn’t think she’s a day over two. i love her extra for that. So much love for such a cute doggie! Aw, there's that adorable face! Oh my, how sweet. 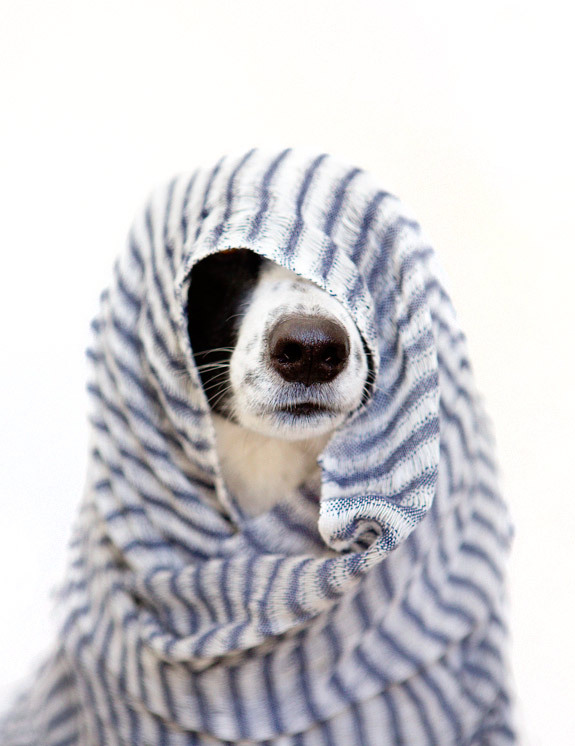 It's good to know my dog is not alone in her passion for wearing towels & blankets as accessories, too! LOVE LOVE LOVE this pic and of course the doggy. Love that picture! Is there any chance to get a high-res version of it? Thanks Sarah.I’II be looking forward to this. CHEERS!